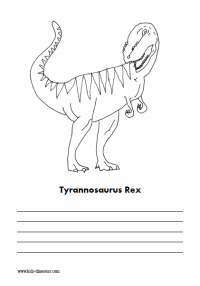 These free dinosaur coloring sheets are perfect for lapbooks - or just some quiet entertainment! Two of these coloring sheets include some lines so you can use them for writing practice, or adding some fun dinosaur facts. To find out more about the dinosaurs, and how they lived, check out the links on Kids-Dinosaurs.com home page. Choose the coloring sheet you like from the pictures below - and click on the image to open the large printable version. This will open in a PDF format, so you will need a free copy of Adobe software. The T. Rex was a large meat eating dinosaur whose name means 'Tyrant Lizard'. 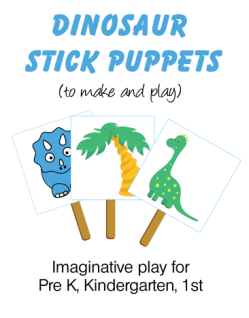 Are you brave enough to color them, and bring them to life! Find out more facts about the dinosaur T. Rex. 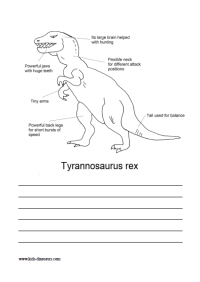 More Free Dinosaur Coloring Pages.